Wikimedia Commons has media related to 1220 . Year 1220 ( MCCXX ) was a leap year starting on Wednesday (link will display the full calendar) of the Julian calendar. 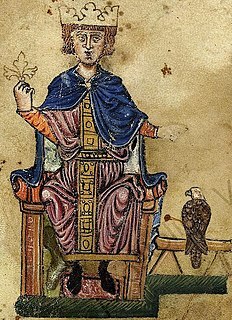 Frederick II was King of Sicily from 1198, King of Germany from 1212, King of Italy and Holy Roman Emperor from 1220 and King of Jerusalem from 1225. His mother Constance was Queen of Sicily and his father was Henry VI of the Hohenstaufen dynasty. Frederick's reign saw the Holy Roman Empire achieve its greatest territorial extent. February 17 is the 48th day of the year in the Gregorian calendar. There are 317 days remaining until the end of the year. Theobald I was the duke of Lorraine from 1213 to his death. He was the son and successor of Frederick II and Agnes of Bar. Year 1226 (MCCXXVI) was a common year starting on Thursday of the Julian calendar. Year 1216 (MCCXVI) was a leap year starting on Friday of the Julian calendar. Year 1218 (MCCXVIII) was a common year starting on Monday of the Julian calendar. Year 1167 (MCLXVII) was a common year starting on Sunday of the Julian calendar. 1 2 Sutton, Ian (1999). Architecture, from Ancient Greece to the Present. London: Thames & Hudson. ISBN 978-0-500-20316-3.